We had the pleasure of studying Interior Design at SCAD (Savannah College of Art and Design) alongside Jordan Shields, and since then it’s been so incredible watching her LA-based interior design practice grow. Known for striking balance between old and new (but always with a nod to LA’s tropical vibe), Jordan Shields Design is well on its way to becoming a household name. While Jordan had worked with a graphic designer at the start of her business, higher-end clientele forced the hand on needing an elevated branded experience. We started by expanding on her existing brand elements so that she would have greater flexible on a variety of print collateral assets, like: note cards, envelopes, and stationery. Jordan’s equestrian background inspired the horse bit to be her icon, with no other design element apart from staying consistent with Futura font. ”I have had a lot of positive comments about how I take time and and go the extra mile to make sure everything is finished off properly on projects. I would like to also have that reflect on everything that is associated with my business like packaging and branded items I hand out.” —Jordan S.
1. What is the purpose of your business and what message are you trying to send to your clients? 2. What’s on your “brand refresh” wish list? ”- Having a solid logo and logo with type. 3. What kind of experience do you want people to have after they encounter your brand (takeaways, feelings, etc.)? We also asked for Jordan to start collecting inspiration on Pinterest. Pins could be examples of other logos, old movie posters, packaging, or anything that struck her as “on brand” that could provide design direction for her new identity. Our team went through this Pinterest board with her so that we could call out reoccurring themes or ask questions about certain images. 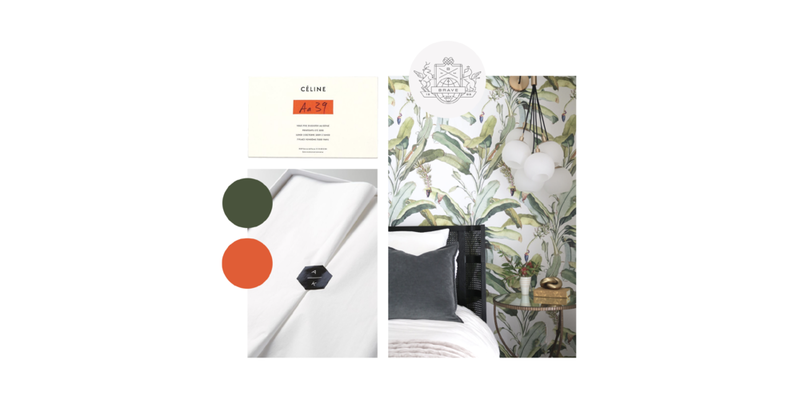 We were inspired by the neutral color palettes found throughout Jordan’s Pinterest board, especially when mixed with a “stamped” strike of color, seen above in the Celine business card. Her palette gives room to either tone down or brighten up her brand depending on the application. The first take at her logo married equestrian elements taken from her previous logo alongside a more stately, “household name” aesthetic seen in some of the most prominent fashion design houses. We then expanded on this “primary logo” and create several secondary marks, all intended for different applications. Below you’ll notice that the primary logo was further developed into what’s on the top of the page. The client was pleased with the direction, but wanted more detail in the horse silhouette. This led to a series of sketches to get the horse shape just right. Are you ready for a brand refinement like what we did for Jordan? Send us an email and let’s get started!